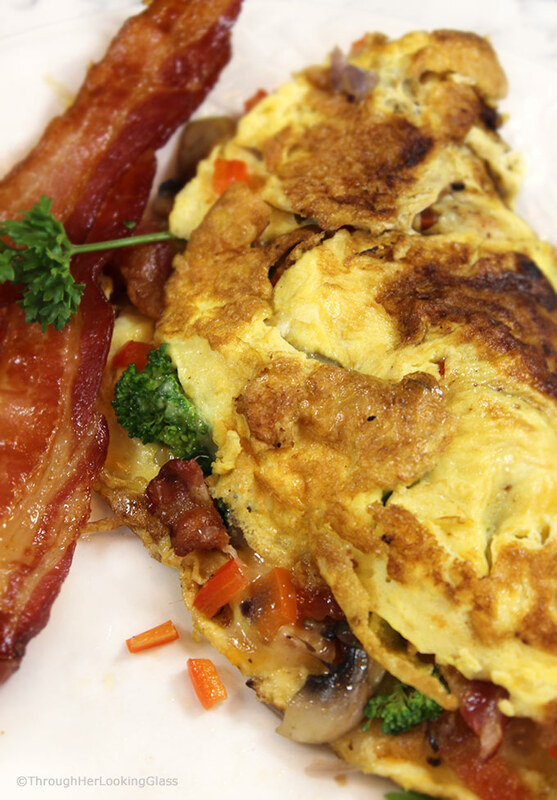 Today we’re talking How To Make the Perfect Omelette! 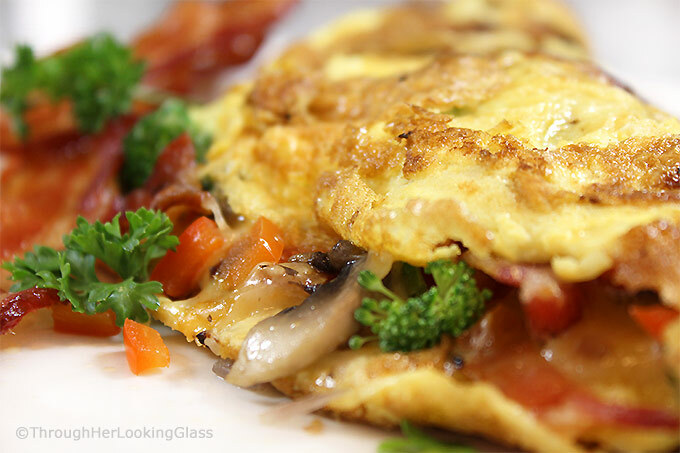 If you love ordering a classic omelette out but are intimidated by the process at home, this step-by-step guide is for you! 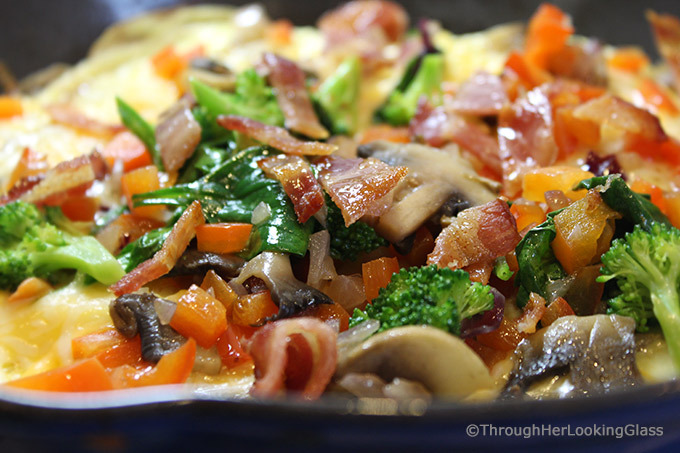 Omelettes are a super easy, protein-filled and nutritious meal for any time of day. You can make a beautiful omelette in about 15 minutes at home and I’ll show you how, in five easy steps. Jon and I have been making omelettes a lot in the past few months. He wields the butcher knife chopping veggies, and I man (woman?) the whisk for the eggs. Like many others, we’re cutting down on sugar and carbs. That means less cereal, toast, breakfast bars, bagels and prepared foods for breakfast. Carbs are quick and convenient with little to no prep, but they only carry you so far energy-wise and then your blood sugar dips. 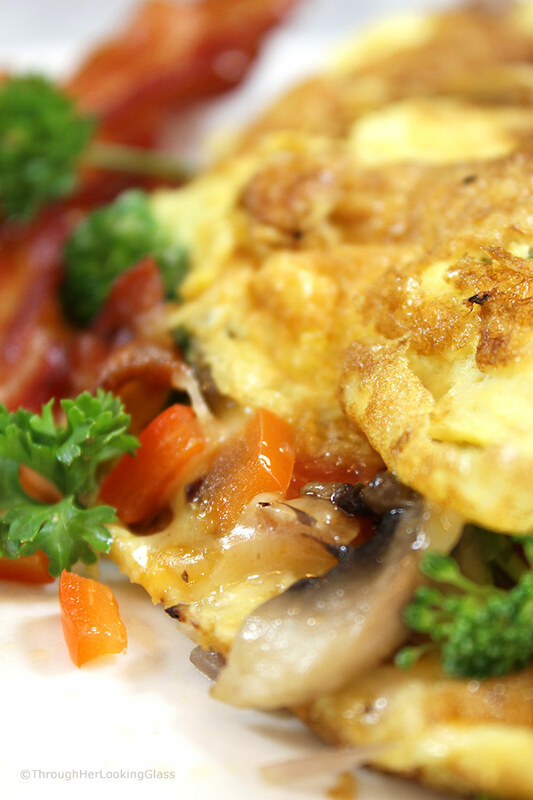 An omelette is the ideal vehicle to include lots of protein and extra veggies in your diet. Sans sugar. Protein is a longer lasting fuel used by the body more evenly over time and helps keep blood sugar regulated. If you spit out the French word omelette three times in a row fast, it’s a tongue twister for sure and an odd two-syllable word at best. The dictionary defines an omelette as “a dish of beaten eggs cooked in a frying pan until firm, often with a filling added while cooking, and usually served folded over”. But an excellent omelette is SO MUCH MORE! 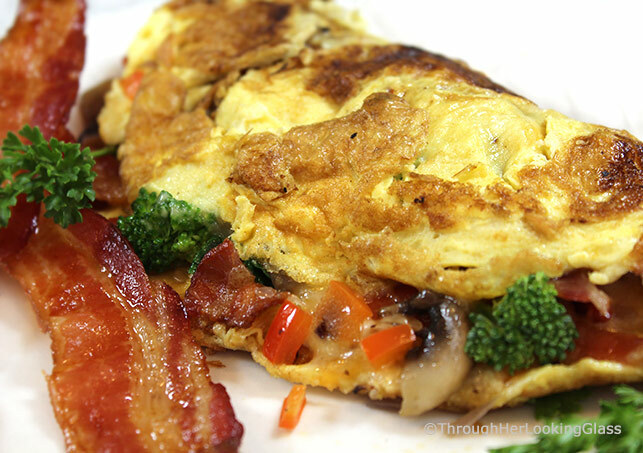 The perfect omelette is within your reach, and I’m excited to show you How To Make the Perfect Omelette step by step today. 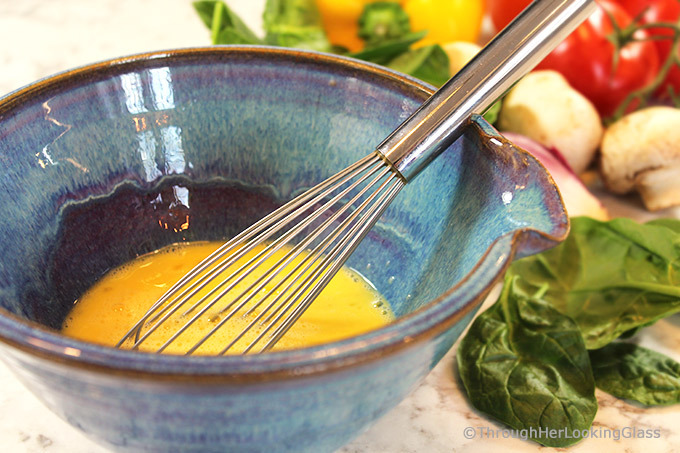 Whisk up 2-3 large, organic eggs in a small batter bowl or electric blender. Set aside. 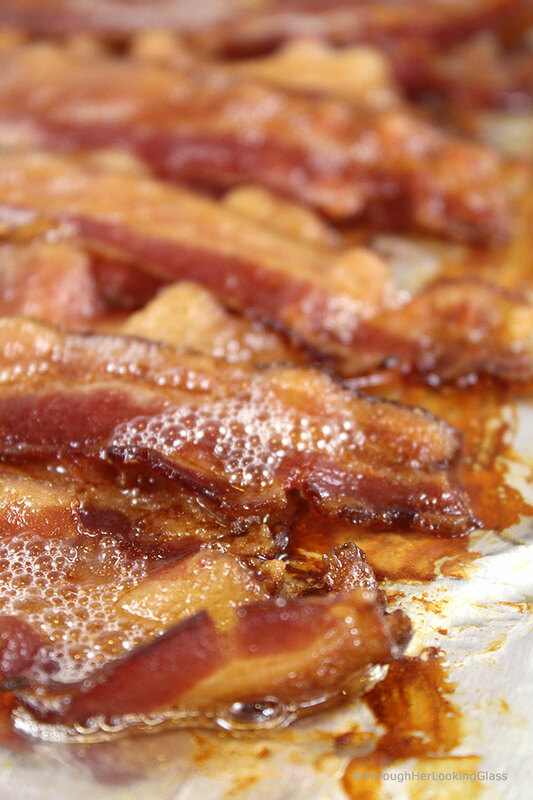 Heat a small amount of olive oil (about a tablespoon) over medium heat in heavy duty 9″ non-stick or cast iron skillet. Generously salt and pepper veggies and stir. 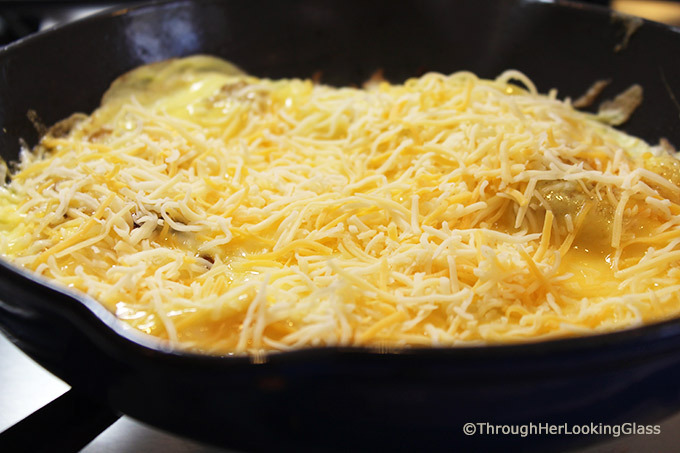 In hot skillet, melt a teaspoon or two of butter, heating over medium heat until sizzling. Tilt to evenly coat skillet. Add a small amount of egg mixture to test. If egg sizzles and cooks immediately, the skillet is ready. You can tell this skillet is hot enough because the eggs are bubbling up and cooking around the edges immediately as they pour in. With a flexible spatula, gently loosen eggs around the edges and underneath as they cook. Tilt the pan so uncooked eggs run underneath the edges of the omelette and cook. Continue this process of loosening edges and underneath and tilting the pan for a minute or two, until the top of your omelette is shiny and most of the eggs from the top/middle have run underneath the omelette and are cooked. Sprinkle with fresh, chopped herbs if you like. When the bottom of the omelette is just turning golden brown, gently loosen the edges and bottom. Using the spatula, carefully lift one side and fold the omelette in half. Continue cooking for a minute or two to let the cheeses melt. Transfer to serving plate and serve immediately, hot. I don’t sautee tomatoes first, I sprinkle them on fresh. Don’t use too many eggs. Use a maximum of four eggs for this size skillet, but 2-3 is ideal. Too many eggs makes your omelette too thick and makes it to crack when folding in half. It also can’t hold fillings well if it’s too thick. Chop your veggies on the smaller side: they’ll sautée faster and your omelette will hold together better. To cut down on prep time, chop up veggies at the beginning of the week and have them at the ready in your fridge. Suggestions: sharp cheddar, monterey jack, parmesan, Mexican blend, etc. In a heavy 9" non-stick or cast-iron skillet, over medium heat, heat up a small amount of olive oil. 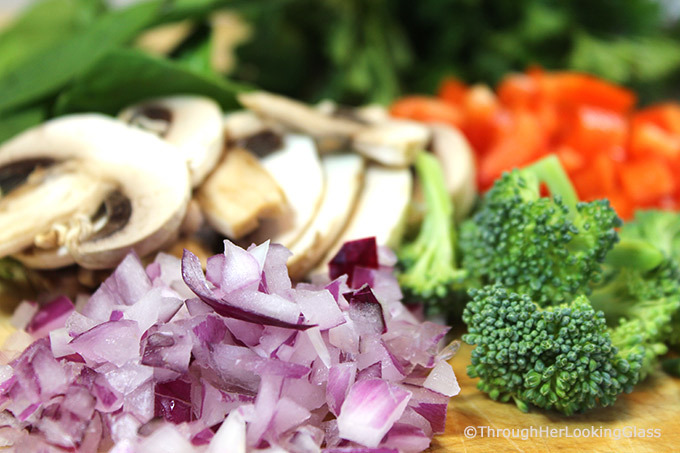 Add diced/chopped and sliced vegetables to skillet, sauteeing until just softened. Sprinkle with salt and pepper. Mix thoroughly. 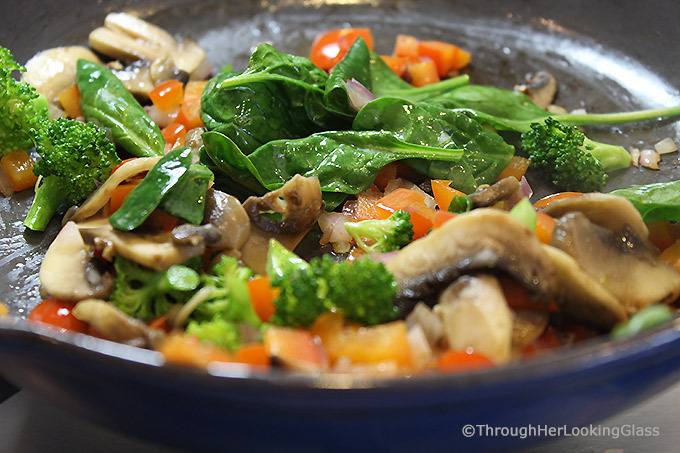 Remove seasoned vegetables from skillet and set aside in a small bowl. With a flexible spatula, begin loosening the edges of the omelet, all the way around the pan. 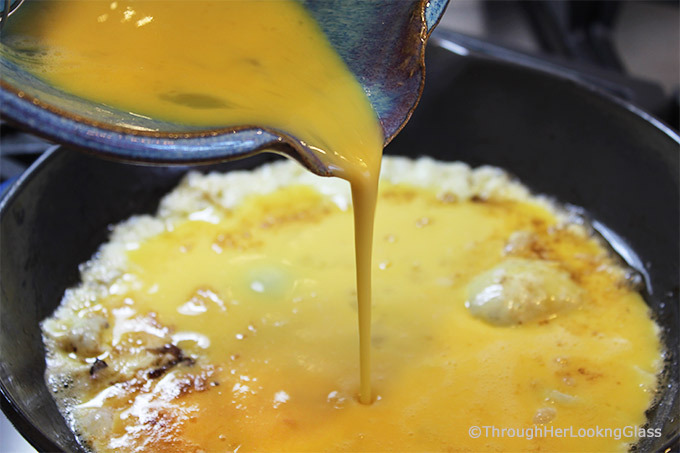 Rotate the pan so that the uncooked eggs in the middle slide underneath the omelette where the edges are pulled away. Sprinkle with grated cheeses, as much as you like. Sprinkle roasted or sauteed veggies on top of the grated cheeses. Sprinkle cooked meats on top. 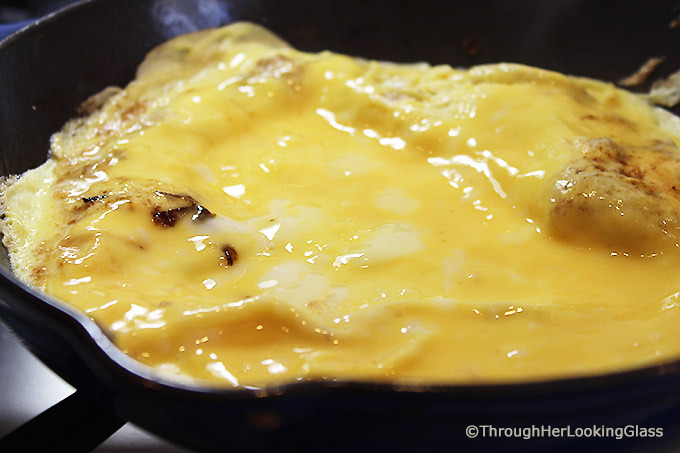 Then fold the omelet over in half, and let sit for another minute or so over the heat to allow the cheese inside to melt. I’ve been looking for a recipe just like this—thanks for all the details—I’ve always had a mental block about omelettes, but now I’m going to try again! What is your favorite flexible spatula for non-stick pans? 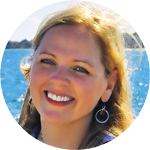 Hi Sue - Hope this works well for you. I hadn't made an omelette in years and I was watching the chef behind the skillet at Wentworth by the Sea last year at a Christmas brunch and he made it look so easy. I thought, surely I can do that. He had all the eggs whisked and veggies ready to go. Then when his skillet was good and hot, all the ingredients were ready and he wasn't scrambling to chop or whisk while the butter burned in the skillet. I think another key is having a good heavy duty skillet that distributes heat evenly. I didn't have one until a few years ago. Friends were moving (downsizing) and offered me their heavy duty Le Creuset. I love it, it works great. I use a heat resistant flexible rubber spatula to lift the edges and underneath, and used my very thin, flexible metal cookie spatula to fold it in half. The metal could scratch if you have a coating on your skillet - but mine doesn't. Thank you Susie - we like these for dinner too! This is such a great post! I love omlettes and always order them when we go out for breakfast, but when I try at home it just becomes a scramble! So I will be trying your tips for sure!! Thank you! Oh thanks Kellie! We were attempting to eat Keto early on in the year and ours were basically a scramble too. An ugly scramble at that. I do think the way to do it is sautee the veggies first, then set those aside and cook the eggs and let them get nice and golden brown on the bottom before adding fillings and folding in half.